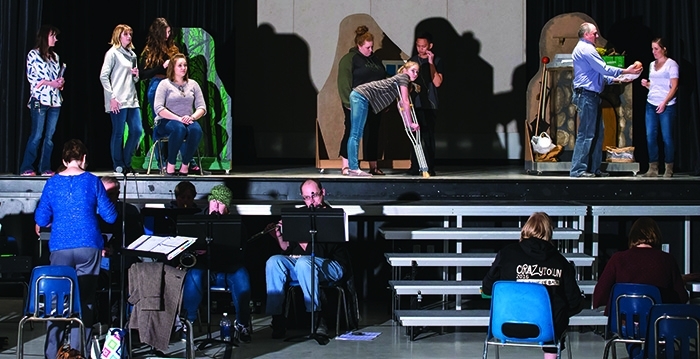 Creative Vision’s fourth production—Into the Woods—will be performed this Friday, Saturday and Sunday, and the excitement in the final week leading up to the play is ramping up among the cast and the crew. There are still tickets available for all four performances—Friday night, Saturday night, Sunday afternoon, and Sunday night—and both Sherri Meredith and Sandra Poole, the two producers of the show, say the production will be well worth attending. “It is always exciting to see what people do,” says Sandra. “The costume people are doing amazing things again and the set design people are making really cool things. And Sherri has these ideas and they come to fruition with the people who work with her. If we want somebody to fly off the stage, they are going to make that work,” she says. “This show has a lot more special effects than others we’ve done,” adds Sherri. Setup in the Conexus Convention Centre began on Friday, and Creative Vision will have all week to hold various rehearsals and put the final touches on bringing the entire production together. “Throughout the week we are going to have some pretty late nights,” says Sherri. “We don’t want to tire anyone out, but there’s a lot to do between now and next weekend to get it to fit into the new space. “You put costumes on them and they are just giddy and it’s hard to focus. It’s another component that’s so exciting,” adds Sandra. “We’ve brought the band in the last three weeks too. That’s so exciting, when you hear the songs with the full band, not just with the piano,” says Sherri. “Angela Thorn is heading up our costume and makeup and she has been living and dreaming about what she is going to do. She’s made Rapunzel’s wig I don’t know how many times,” adds Sandra with a laugh. “It’s just so much fun to see all of the arts come together and everybody having fun. All of the actors in the show are double cast over the four nights, so people will get a chance to see everyone in the cast. “We have found a way that everyone can be in every show,” says Sherri. “No matter what night you’ll see, you’ll see the entire company. Some people are in a main role or a secondary role for that night, and the next night it swaps. Both Sandra and Sherri say the storyline of “Into the Woods” is one that everyone will enjoy. “It’s a wonderful story,” says Sandra. “We have the three pieces—Cinderella, Jack and the Beanstock, and Rapunzel with the baker and his wife who can’t have children because the baker has stolen beans from the witch. In comes little Red Riding Hood. “And although it seems like it’s a children’s story, it has a real adult undertone to it,” adds Sherri. “There’s something for everyone in it. A younger viewer is going to enjoy the storyline and costumes and sets and the characters, but a more mature viewer is going to appreciate the humor and the sincerity, and the dramatics that come with it. “The family keeps growing,” says Sherri. A massive amount of time has gone into the performance since practices began at the beginning of August. “Starting in beginning of August we do something every day for at least a few hours before we even get it started. There’s not a lot of time to sleep in a day,” says Sandra. Despite the staggering amount of work that goes into these shows, both Sandra and Sherri say they love what comes of it. “It is so rewarding to see our local community shine in all of these areas,” says Sandra. “What a lot of talent they have—a huge amount of talent—and there is something about the arts community—once we got rolling six years ago we needed it to continue because it’s so important. You can play an instrument until you’re 80 or 90. You can’t skate that long. It’s so healing for a person to sing, it’s so important for people to be singing, whether it’s in the shower or on the stage. It’s so important for your mental health. “There are people in our community who just love to perform and we have given them a platform for other people outside their little realm to see them shine. Not only do the performances support local talent, all money raised at them goes back into the Conexus Convention Centre. Over the years Creative Vision has added stage lights, curtains, risers, projector mounts, and a keyboard for the MCC Centre. They are hoping in the future to purchase a temporary floor for the stage that can be put down and taken back up to keep the stage in good shape, and to add a sound booth at the back of the hall at some point. There are four performances of “Into the Woods”—one on Friday at 7 pm, one on Saturday at 7 pm, and two on Sunday at 1 pm and 7 pm. Tickets are on sale all week long this week and can be purchased by calling or texting Dianne Wilson at 306-434-7124.